How to beautify your retails stores easily and effortlessly. 5 Powerful tips for brands who support retail visual merchandising. Here is why this is important. With consumers demanding a better in-store experience, retailers have to step it up. The retailer is forever hard-pressed for more in store visual merchandise that supports your brand or product storytelling. Moreover, you know if you don’t do it your competition will. This article can help you fast-track your effectiveness the least amount of wasted effort. Cruise this infographic for the cliff notes, or read on below. At the very bottom, we give you our take on why this topic is important, how to do it, and what we think about it. Smoother workflow add value. Its simple anything that does not add value to your customer or brand, or the relationship should be eliminated. For example, your customer, (end user and retailer) does not care that you ran around like crazy to make a poster or banner happen for them, they don’t care that your warehouse team packed it up custom and shipped it. They don’t care that your accounting team had to pay three different vendors, and then create three different expenses to keep the accounting straight. Nope, after the dust settles they care about the image and the product that sits right in front of them in the store. Is this cool, functional, etc. It’s about their needs. Telling that story is really what you do best. So you should put the most amount of time into the creative asset. To do this simply eliminate things you or your co-workers should not be doing in the first place. For more on this, we highly recommend the book Atomic Habits By Jame Clear (Amazing Blog). He is a thought leader on the topic of changing habits. Anyway one of his techniques is to examine your routine. And then take steps to change it. 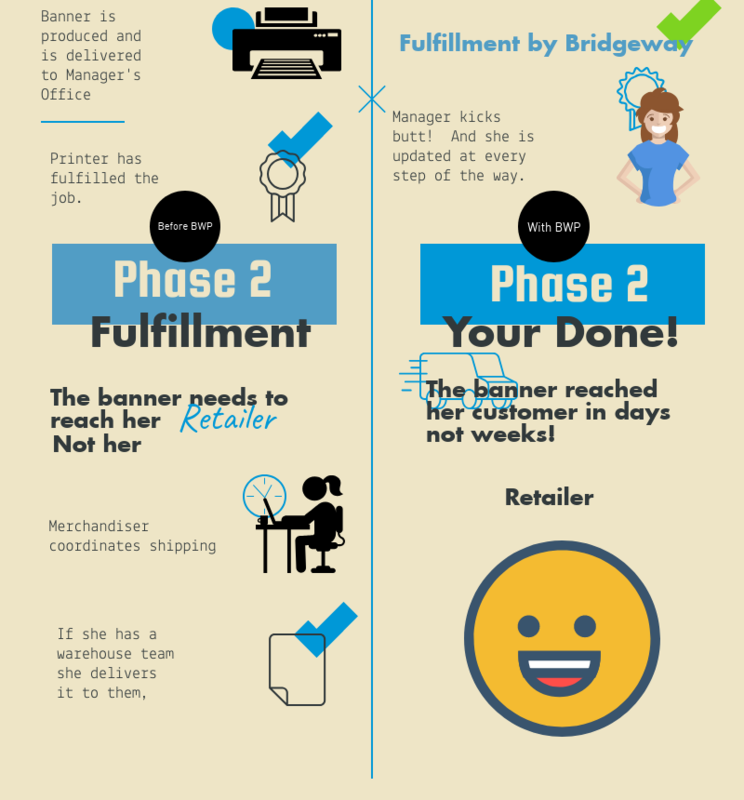 That’s kind of what we did here with our infographic and it is a big part of why we developed our drop ship fulfillment program. Since we do this all the time, We think we’re better at it. So why not make your life easier, and turn it into one of our services. That’s what we did. Smoother workflow means more time is spent on quality. Smoother workflow also means they get top quality creative visual merchandise / POP without drama. 5. Cost savings and faster turn around times. Visual displays, banners, posters, signs etc. Especially big images don’t pack up well. Properly picking, packing (custom packing is expensive and so is the time for the warehouse crew.) and shipping is hidden cost the marketing team nor the accounting team can easily see until after the fact. This means fulfillment prices can sore to a much as the production cost of the product. Visual Merchandise seems to be a fancy way of saying in-store banner, Poster, Point Of Purchase display. These are familiar words for any Merchandising Manager should be focused on stepping up their brand message with high quality in the retail environment. Think about your in-store user experience. Whom do you want controlling it? You, your retailer or your competition. In a world of haves and have-nots created by the internet. You will either have great UX (online and offline) or not. You have to cross-market in all channels. Not investing in offline visual graphics means you will suffer in stores. Here is a great report (sign up and download it. It’s interesting) In-Store Shopping Behaviors: Why Shoppers Make the Trek to Stores Smart brands have noticed this in-store shopping trend. And its great news for specialty retailer and brand that sell in that channels. We think it great because specialty retail is so chunked down, they are experts, They ooze user experience. They just use it. (Amazon can’t BTW, and the makes the specialty retail channel pretty interesting. However, we also believe if a retailer slacks or does not step up UX fast enough, A good retailer will. This tilts the advantage to the good retailer with a better UX. So there it is the haves and have-nots. It’s worth investing in more now than ever. This blog post is all about how to make it and ship it with the least amount of friction for you, your customer and your organization. 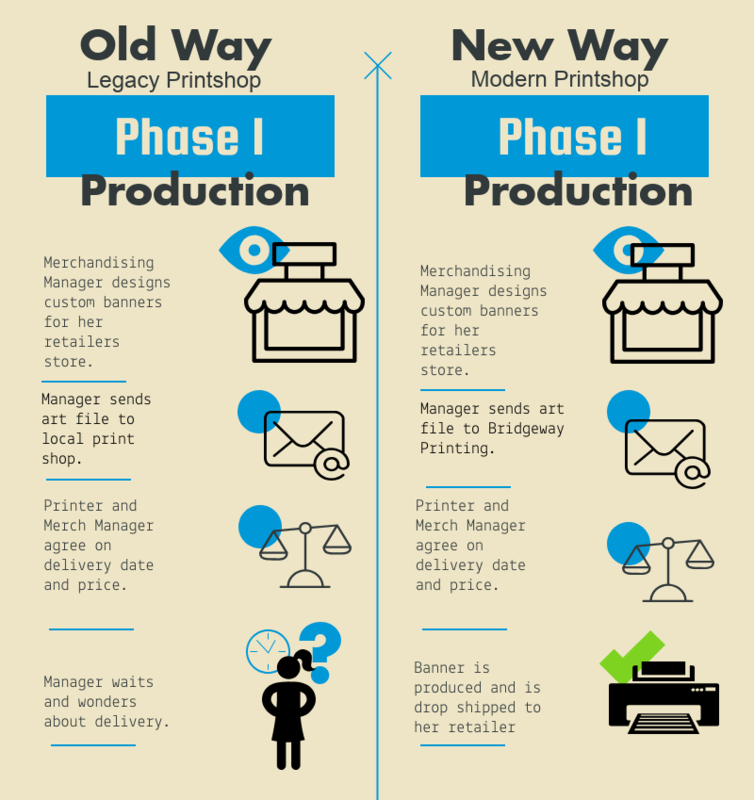 Your Print-shop should have a wide range of media and printing capabilities. Including larger format flat stock media and large and grand format banner and canvas capabilities. Vinyl wraps, wall graphic, and window graphics are all super important. They need to have it all. They also need to have a robust fulfillment program. If they do your life will be easy and your projects will be delivered on time, and within or below budget. 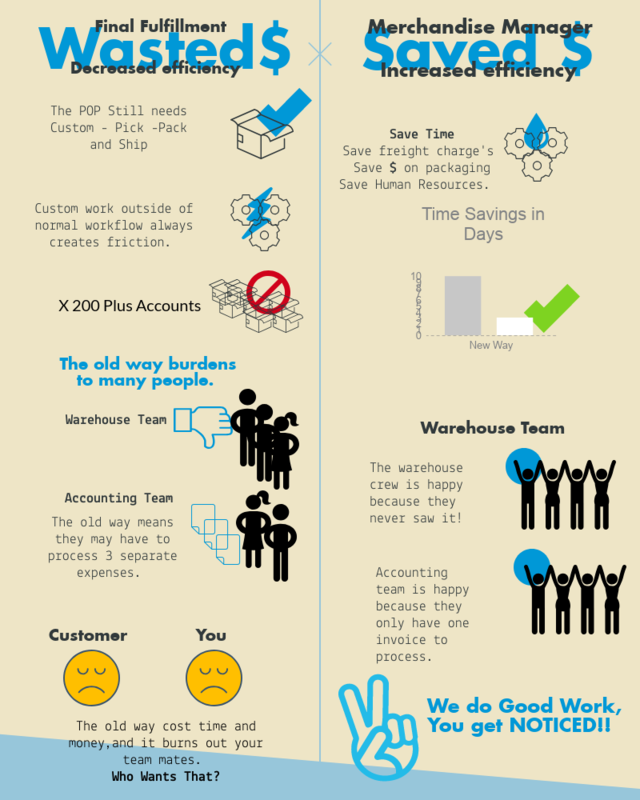 You will have a happy retailer, end customers, accounting team and warehouse folks that love you! The other cool thing is when you get this workflow dialed in your going to be building and shipping more visual merchandise / POP than your competitors. Which means your brand is getting noticed. If you have lived the old way, you understand the pain points and friction it causes. Nows your chance to examined your companies routine. New tool and thinking can lead you and your team to a frictionless process for getting your merchandising assets to your customer.